In the two previous installments of our series on given names (Part 1 and Part 2), we considered various aspects of the given name data from 1880 to the present day compiled by the Social Security Administration . In this final article, we are going to have a look at the incidence of unisex names and nicknames. Of the 91,320 names in the database, 8,691 (just under 10 percent) have been used for both genders. These “unisex names” (also known as epicene or gender-neutral names) are becoming more prevalent. Some names have always been used for both boys and girls. New names are also continuously being introduced, many of which are also immediately applied to both genders. Bennie was unisex from its appearance in the data in 1880. Bobby has been applied to both genders from its first recorded use in 1900, although it has been given to girls progressively less often over time. Clare also started out as a unisex name in 1880, but over time its use for boys has declined; there have been no boys named Clare for over a decade. Cyncere has only been in use since 1999 but has been applied consistently to both genders. Delorean was first used as a unisex given name in 1982. However, it has recently been given only to boys. Not too surprisingly, it was first used between 1981 and 1983 when the DeLorean DMC-12 was being manufactured (some years before the release of “Back to the Future” in 1985!). Halley was introduced as a given name in 1910 when Halley’s Comet was visible to the naked eye. Interestingly, although Halley was given to boys and girls in similar numbers in 1910, it subsequently became a girls’ name. In 1985 and 1986 (the years around the re-appearance of the comet), there was once again a representative fraction of boys named Halley. At the other end of the spectrum, some names were traditionally used exclusively for either girls or boys but are now being applied to both genders. Halsey was originally a boys’ name and was only given to a girl for the first time in 1981. Indiana was used exclusively for girls until 1990, when it was adopted as a boys’ name as well. This might be linked to the “Indiana Jones” movies which appeared in the 1980s. Why did George Lucas choose this historically feminine name for his overtly masculine hero? Other examples of names which only recently became unisex are Campbell, Moe, Embry and Franc. Are unisex names shared evenly between the sexes? 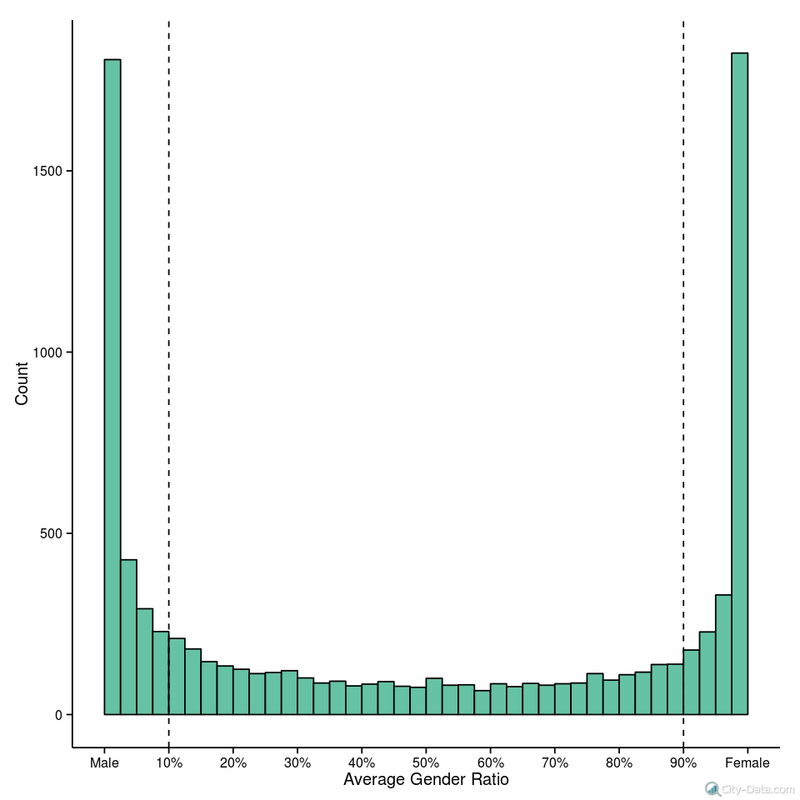 The histogram below shows the distribution of unisex names in terms of their proportional application to each gender. The peak on the left represents names applied almost exclusively to boys, while the peak on the right displays the equivalent for girls. The distribution is distinctly bath tub shaped; the vast majority of names are still applied predominantly to one gender or the other, and therefore fall in the extreme bins on either side. The peak on the left includes names like Matt, Bart and Norbert, which have been given to only a few girls. The peak on the right captures predominantly girls’ names like Daphne, Sybil and Scarlett, which have been assigned to only a handful of boys. Clearly, these names are widely considered to be either masculine or feminine. In the middle of the plot lie names which have an even split between boys and girls. Here we have, for example, Gabriyel, Keagyn, Laetyn, Nicola, Jacyn, Kobi, Babe, Tracy, Rael, Codie, Adrean, Daine, Germany, Burnice, Mikah, Shelby and Quanta. Interestingly, these truly unisex names are generally ones that have only entered popular use in recent years. Although some countries impose legal or social restrictions on unisex names, they are fairly common in the U.S. But just how common are they? In order to restrict our attention to those names which are truly unisex, we will limit ourselves to names that have a gender ratio between 10 percent and 90 percent (between the vertical dashed lines on the histogram). To determine whether the use of these names is accelerating, we can compare the number of unisex names to the total number of names in use. 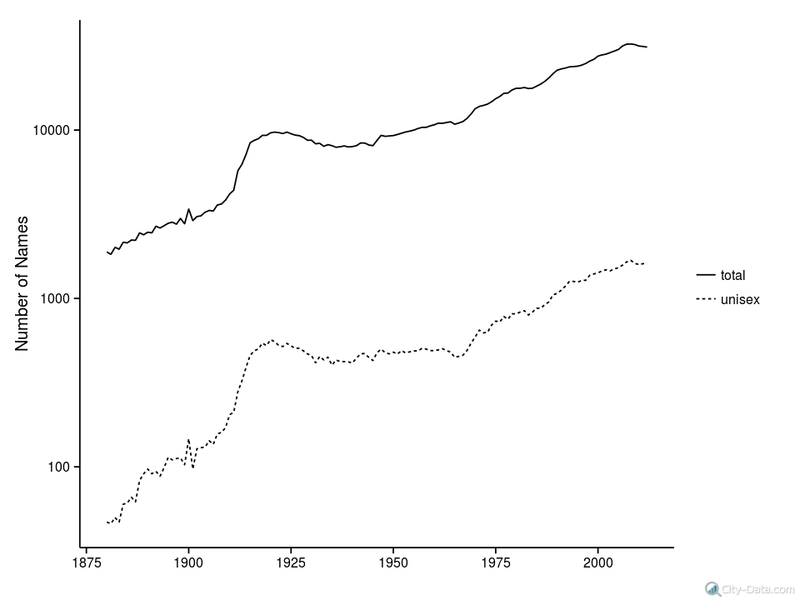 The plot below shows how the number of given names climbs from 1,889 in 1880 to 31,109 in 2012 — a growth of more than 1,600 percent. In contrast, the number of unisex names expanded from 47 to 1,604 over the same time period, which is an increase of roughly 3,400 percent! The proportion of names being used for both genders has grown from 2.5 percent to 5.2 percent; clearly, unisex names are becoming more fashionable. There is also a growing tendency for children to be given names that would traditionally be considered nicknames. 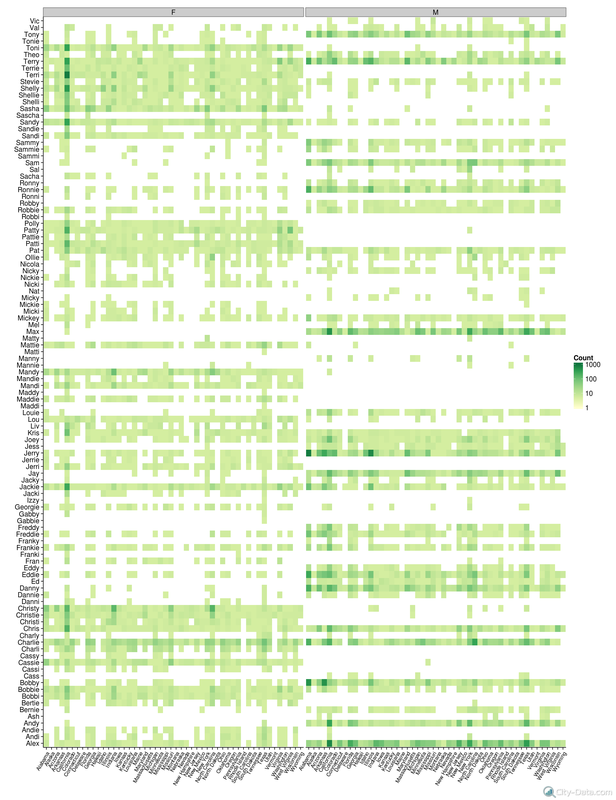 The plot below shows the incidence of a selection of nicknames as given names across states in the U.S. Many of these nicknames are unisex as well. For example, Terry, Chris and Alex are used for both girls and boys across almost all states. Nicknames are derived in a variety of ways. Some are contractions of longer names, like Sam from Samuel, while others are expansions of shorter names, like Frankie derived from Frank. Letter swapping is another route to nicknames: Izzy from Isaac, Isaiah, Isabel or Isabella, and Joey from Joseph, Josephine or Joanna. Both Izzy and Joey are obviously unisex too! Still others are formed by truncating a name and adding “i,” “ie” or “y” — for example, Maddi, Charlie or Sammy. Many nicknames are homophones, pronounced the same but spelled differently, such as Charli, Charlie and Charly. So which unisex names are going to be popular in the next few years? Dakota, Justice, Jessie and Casey have rated highly in recent years, and are likely to be popular in the future as well. Other possibilities are Riley, Quinn and Skyler. Of course, you don’t need to follow the crowd. There are a host of other names ranging from the common to the esoteric. How about Windsor, Rhen or Tyme? Andrew lives in Durban, South Africa, with his wife and an extensive collection of used running shoes. 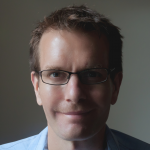 He has a Ph.D. in Physics from the Royal Institute of Technology, Stockholm, but is currently masquerading as a Mathematician. He is interested in data analysis, automated FOREX trading, photography, cooking and running.